Nearly two weeks ago at the gym, thanks to the encouragement of my trainer, I jogged a mile. To a lot of people, that probably isn’t a big deal but it was my first mile jogged. Ever. And then the next day? I did it again. Two days later? I did it again. I’ve jogged a few miles since. And you know what? When I wasn’t hating it, I absolutely loved it. And then came a flash of brilliance. Why not do something I enjoy and do something good at the same time? Either way, no matter what inspired it, I’ve signed up to run the Sport Relief Mile in my area on 25 March. As one of the UK’s biggest fundraising events, Sport Relief brings the entire nation together to get active, raise cash and change lives. 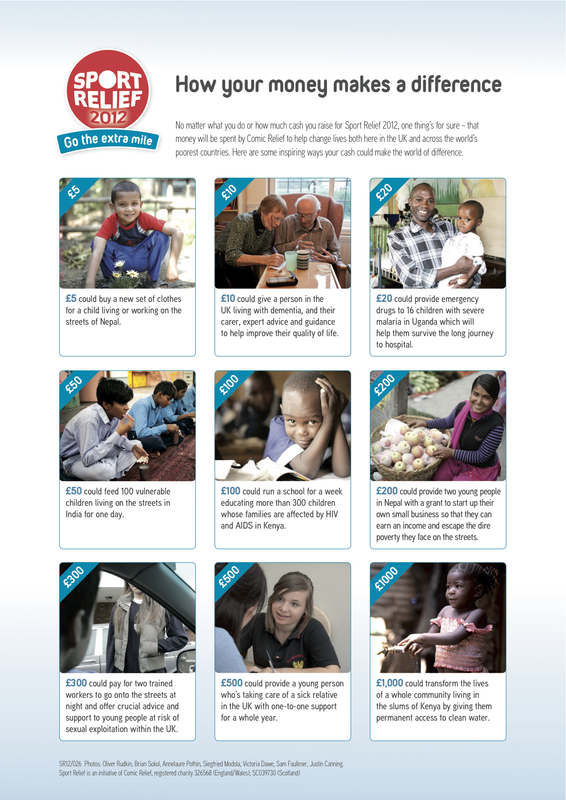 All the money raised by the public is spent by Comic Relief to help people living incredibly tough lives, both at home in the UK and across the world’s poorest countries. Sport Relief was introduced as a second major Comic Relief initiative in 2002 – taking place on alternate years with Red Nose Day. It has grown fast, and in 2010 over £44 million was raised – breaking all records. In 2012 over one million people are expected to take part in the Sainsbury’s Sport Relief Mile as they raise cash to change lives at home and throughout the world’s poorest countries. And with a whole weekend of entertainment planned across the BBC, it’s all set to be huge. So be part of the action and go the extra mile for Sport Relief 2012. So I’ve signed up to run a mile for Sport Relief. How exciting is that? I’m doing something good for me and doing something good for the community at the same time. My fundraising target is only £100. That’s not a hell of a lot and I know I can totally achieve that. I mean, that’s 10 of you guys donating £10. That’s less than a week of tall lattes at Starbucks. And how many family members and friends do I have? A heck of a lot more, let me tell ya! And the beauty of Sport Relief is that anyone can donate! All you need is a credit/debit card or paypal account. Head over to my donation page here to donate in my name. You can make your donation public or anonymous, but if you do donate in my name please let me know so I can give you a huge hug for being so awesome the next time I see you. And American family and friends–you can donate online too! You don’t have to live in the UK to donate online. Even so, I’m going to make it super easy for you to donate: if you’re worried about exchange rates or international bank fees (they’re super minimal), email or send me a message and let me know how much you want to donate. I’ll donate it for you and get it back from you in cash when I’m home in June. And I’ll do it without the exchange rate; so if you want to donate £10, I’ll just collect $10 from you… not $12 with the exchange rate. So you’re actually getting off cheaper! So why wouldn’t you WANT to donate? And actually, my lovelies, there’s something in it for you all as well besides knowing you’ve given an amazing gift to a fantastic charity and made my day. I’ve made it a bit more interesting and set some great fundraising targets for you guys. £25 raised: me running with a funky hairstyle and face paint. £50: me running with a super fabulous, customized t-shirt thanking all of my donors (by name or nickname!). £100 (my target): me running in all of the above plus leggings and a tutu. Yes, you heard right. A tutu. What could be more hilariously enjoyable than that? There will be pictures, of course. Donate as little or as much as you like, even down to spare change under the sofa cushion. Every last penny helps. I’ve taken my first step. Now it’s up to you guys to help me through the rest. Feel free to pass on my donation page or even this blog post to any friends or family who you think might be interested in donating. Again, my donation page is here. If you have any questions or want to make a pledge, don’t be shy! Get in touch!